As the blob spread, unusually warm waters triggered extended harmful algae blooms. Although such blooms are common, they usually only last a couple of weeks before dissipating. However, the blob fueled longer-lasting and more pervasive blooms, which became toxic to marine life and humans. Higher ocean temperatures also increased warm water algae species, which were less nutritious for marine life. By the end of 2015, both blob and blooms had shut down much of the Pacific fishing industry and upended the marine food chain. Dead fin whales and sea otters began washing up along the Alaskan coast. 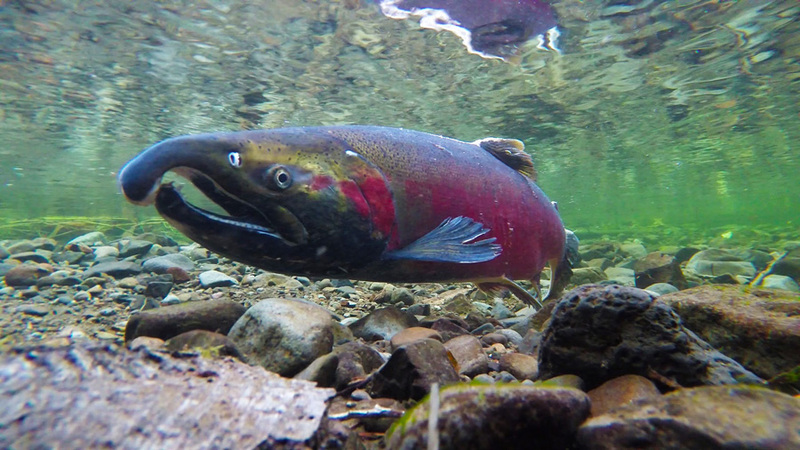 Chinook salmon populations in Washington and Oregon plummeted. 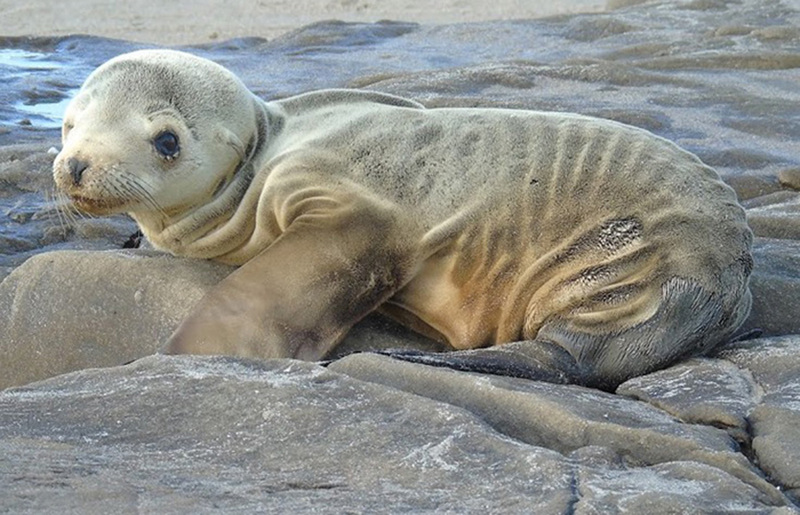 Hundreds of sea lions starved along California shorelines. Scientists were left scratching their heads. Why had this warm pool of ocean water spread so far and lingered for so long? One of these scientists, researcher Chelle Gentemann, grew up on the Pacific Coast, where she and her family spent summers fishing for salmon. Now an oceanographer, Gentemann tracks ocean temperatures, and the blob had caught her and her colleagues’ attention. In September 2014, NOAA scientists noted that a buoy off the coast of Newport, Oregon, recorded a seven-degree Celsius (thirteen-degree Fahrenheit) rise in temperature over the course of only one hour. “I know that area really well, and seven degrees is a huge jump,” Gentemann said. 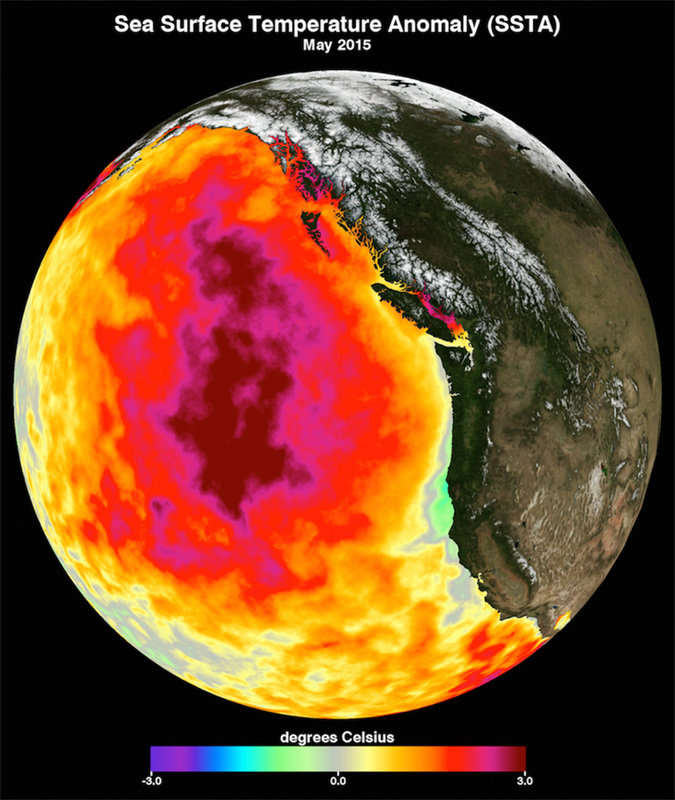 Although El Niño conditions were present in 2014, and typically cause warmer oceans and milder winters along the Pacific Coast, researchers ruled it out as a source for the blob. “The El Niño was very weak that year,” Gentemann said. “And it has a very distinct signature in how the heat is transferred from the equatorial Pacific up through and along the California coast. And the pattern just didn’t match.” The blob had formed in the Gulf of Alaska, and spread south. Slight El Niño warming may have magnified some of the temperatures along Mexico and southern California, but it was not behind the blob’s persistence or behind the marine die-offs stretching from California to Alaska. To figure out where this inexplicable warmth was coming from, Gentemann and her colleagues tracked ocean temperatures using an ensemble data set: the Multi-scale Ultra-high Resolution Sea Surface Temperature (MUR SST) Analysis. This ensemble product combines readings from several satellite sensors, and is available from the NASA Physical Oceanography Distributed Active Archive Center. “Prior to the MUR SST with its one-kilometer resolution, we really didn’t have that glimpse into what was happening along the coast because the satellite data were very spotty,” Gentemann said. Getting a more detailed look at the coastal environment is crucial for understanding ocean mixing. This mixing helps disperse heat from the upper layers of the ocean into deeper waters, while at the same time upwelling cooler, nutrient-rich waters. Nutrients surfaced by upwelling form the basis of the marine food chain. When upwelling is disrupted, so is the coastal food supply. Because upwelling is fueled in part by temperature, even just a few degrees of abnormal warmth can slow or halt the cycle. But upwelling also depends on winds to help push surface layers away from the coast, providing a horizontal assist to the vertical top-to-bottom upwelling circulation. To complete the emerging picture of a coast in distress, Gentemann incorporated two wind data sets. The Bakun Upwelling Index measures sea level pressure as a proxy for wind stress at the ocean surface, and the European Centre for Medium-Range Weather Forecasts Re-Analysis-Interim Winds product provided wind velocity data. Gentemann and her colleagues found that prolonged heat from the blob, combined with unusually weak coastal winds, hindered upwelling along much of the Pacific Coast during the marine heat wave. Like the blob, the weakened winds were unusual. Atmospheric rivers normally delivered a steady stream of winds and precipitation from the Pacific. But these rivers were being blocked by a persistent ridge of high pressure in the atmosphere that hunkered over the north Pacific between 2012 and 2015. “It was preventing the winter storms from hitting the West Coast,” Gentemann said. Storms typically usher in windier weather along the coast that help churn the ocean surface and foster upwelling. “There were just no storms. It was just sunny the entire winter,” Gentemann said. “The storms would come up and then they’d hit this ridge and go north.” Fewer storms meant less wind, less upwelling, and fewer nutrients for fish, but ripe conditions for extensive algal blooms. This devastating combination starved whales, sea lions, fish, and a host of marine life. 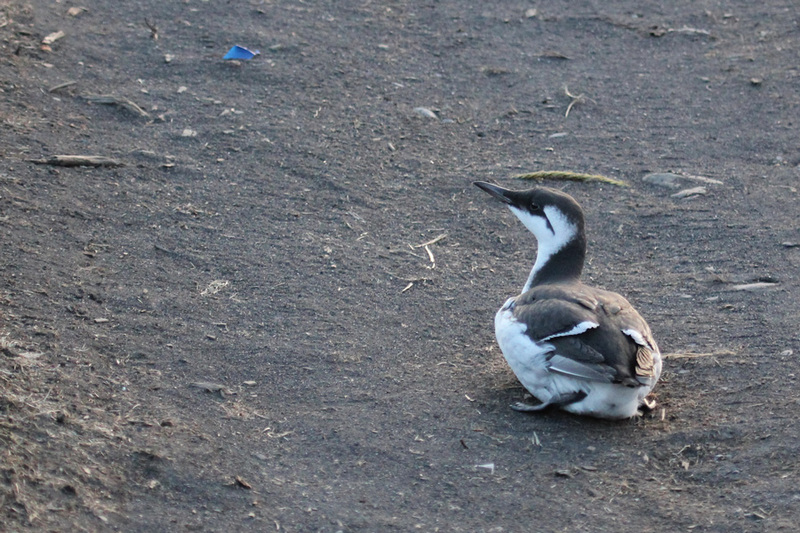 Even seabirds like common murres, which feed on fish and mollusks that flourish in typically cold coastal waters, starved along coasts from Alaska to California. Scientists do not yet know what caused the unprecedented atmospheric ridge, or why it persisted so long. Some research hints that overall ocean warming stimulated this response. Other research indicates the opposite, that the ridge caused the blob to form, and a persistent feedback compounded the multi-year endurance of both blob and ridge. Yet other studies implicate changes in Arctic sea ice that cause shifts in global atmospheric patterns. The atmospheric ridge dissipated in 2015, and the blob finally subsided in early 2016, but marine animals—and the many coastal industries that depend on them—will take much longer to return to normal. Some species may take years to recover. Waylaid by the disaster, some fisheries and canneries shuttered their doors. Gentemann, C. L., M. R. Fewing, and M. Garcia-Reyes. 2017. Satellite sea surface temperatures along the West Coast of the United States during the 2014-2016 northeast Pacific marine heat wave. Geophysical Research Letters 44: 312-319. doi:10.1002/2016GLo71039. JPL MUR MEaSUREs Project. 2010. Multi-scale Ultra-high Resolution (MUR) Sea Surface Temperature (SST) Analysis (MUR SST) v4.0. PO.DAAC, CA, USA. https://podaac.jpl.nasa.gov/Multi-scale_Ultra-high_Resolution_MUR-SST.